In Walking Washington’s History: Ten Cities, a follow-up to her bestselling Hiking Washington’s History, Judy Bentley uses engaging guided urban walks to trace the state’s history and show each city’s importance in the unfolding story of Washington state. By walking each city, Bentley suggests, you gain a deeper understanding of how history connects with the visible markers overhead and underfoot. Here Bentley offers a glimpse of these cities through photos of their historic main streets. Seattle Public Library with Elliott Bay Books, Central Library, Sunday, April 24 at 2:00 p.m. Words, Writers, and West Seattle at Barnes and Noble, Westwood Village, Friday, May 6 at 5 p.m.
Every historic city in Washington had a main street although it wasn’t always called that. Sometimes it was a trail that became the main way through town—the Nez Perce Trail in Walla Walla, the Oregon Trail in Olympia. Sometimes the main street was a river, such as the Columbia River in Vancouver or the Spokane River in Spokane; a bay could also be the central thoroughfare, as in the case of Commencement Bay in Tacoma or Port Gardner Bay in Everett. In Seattle the first main street was a skid road for logs, now known as Yesler Way. These arteries were the centers of civic life, the places where the most important moments in a city’s history occurred. The wagon road at Fort Vancouver, established in 1825, paralleled the Columbia River, the first avenue of east-west transport in the region. 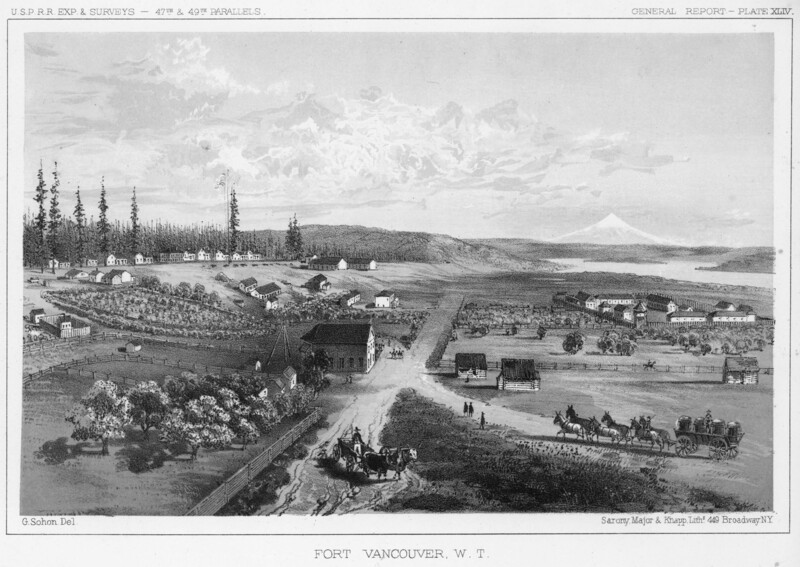 The town of Vancouver grew on the river’s banks west of the fur-trading post, starting in the 1840s and 1850s. It ballooned as a city during World War II when Henry Kaiser located shipyards on the river’s northern and southern banks. Olympia sat at the southern end of Puget Sound and the northern end of the Oregon Trail route to Washington Territory. Because of its location, the village became the territorial capital in the 1850s, a status made official at statehood. Main Street, renamed Capitol Way, led up the hill to the first white frame capitol building. A crowd gathered there for the inauguration of Elisha P. Ferry, the first governor elected by Washington citizens in 1889. Many arrived by horse-drawn carriage over the muddy streets. Courtesy The Walla Walla Union Bulletin. On the eastern end of the territory, Walla Walla grew on the Nez Perce trail, a major east-west travel route for the Nez Perce people. Gold discoveries in what is now Idaho brought thousands of prospectors rushing through the frontier town on the way to the mines. Long trains of mules and horses filled the wide trail that became Walla Walla’s main street. This stagecoach rumbles down Main Street in a 1958 re-enactment of the 1860s decade when Walla Walla was the largest city in the territory. But not for long. Tacoma grabbed that title in the 1870s and 1880s when the Northern Pacific Railroad chose Commencement Bay as its terminus. A mile-long warehouse extended along the waterfront to hold lumber, grain, and ore transported from the hinterland. These tall-masted ships along the city waterway extended the rails to sails journey. Photo by Jack Carver, Whatcom Museum no. 1995.14.70. The wealth of Washington cities on Puget Sound came first from the trees cut down along main streets. Early Olympia, Tacoma, Seattle, Everett, and Bellingham all prospered from the export of logs. The “World’s Tallest Christmas Tree” moves down Railroad Avenue in Bellingham in 1949. Two cranes and fourteen trucks lifted the 153-foot tree upright, and it was decorated with more than a thousand lights. Seattle’s streets hummed during the Alaska gold rush of the 1890s. When argonauts returned to Seattle in 1898, crowds greeted them on the dock along what became Alaskan Way. Yakima is a market city, hub of the Yakima Valley hinterland. Irrigation made the valley bloom. This crowd paraded down Yakima Avenue in 1903, following President Theodore Roosevelt as he toured the West to promote the effects of the Federal Reclamation Act of 1902. The Yakima Project, eventually irrigating 464,000 acres, was one of the first and largest efforts of the Bureau of Reclamation. The citizens were right to celebrate; the act brought prosperity to Yakima. Image courtesy of the Eastside Heritage Center. Bellevue Square signaled the demise of Bellevue’s old main street and perhaps the death of the main street concept. These cars parked at the first version of the shopping center, begun in 1946, were overshadowed by a beloved Madrona tree on Bellevue Way. Judy Bentley writes hiking guides, history, and biography and is emeritus faculty at South Seattle College. She is the author of Hiking Washington’s History and (with Lorraine McConaghy) Free Boy: A True Story of Slave and Master. This entry was posted in Events, Guest Post, History, Pacific Northwest, US History, Western History and tagged Judy Bentley, Pacific Northwest, Seattle, urban history, Walking Washington's History on March 16, 2016 by uwpressblog.